I have wanted to read this book for many years, and really hoped upon borrowing it from the library that it would not disappoint. So many books which I have believed that I would adore have been far less absorbing than I would have hoped of late, July’s People by Nadine Gordimer being a prime example. I had not read any of Trapido’s work before I picked this up, and was not quite sure what to expect from it. I love the premise of this novel – two sisters growing up in the shadow of apartheid, and their naivety and the actions of others confusing them entirely. 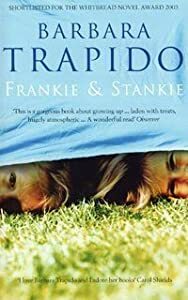 Joanna Briscoe, the author of the book’s short yet rather lovely introduction, says that Frankie and Stankie should be read as a ‘thinly-disguised memoir’ of life in 1950s South Africa. I adore coming of age novels, particularly those set against important historical events. Lisa and Dinah, the sisters whom we follow from babyhood to early adulthood, are the daughters of liberal parents – a Dutch immigrant father and German mother. I really did like Dinah, and the progression of her character from start to finish was ultimately believable. The third person perspective which Trapido uses in her sixth novel is engaging from the first. The social and historical elements which she has utilised are well portrayed, and all help to build up scenes of life in the tumultuous period. The plot is not chronological; rather, the whole is made up of fragments of memories, and the whole is almost entrancing in consequence. Throughout, Trapido writes so well, and the novel is beautifully crafted. It reminded me a little of Carol Shields’ stunning The Stone Diaries – high praise indeed. In Frankie and Stankie, Trapido has written a fascinating portrayal of an horrific period in South African history. The vast disparities between the black and white races have been intelligently set out and dicussed. The only qualm which I had with the novel was its afterword – it did not seem all that necessary, felt too matter-of-fact, and detracted from the splendidly woven story. If the afterword had not been present in the novel, I would have happily awarded the whole five stars. I love Trapido. Please read her other books. I was so happy to discover her many years ago. I never read this one because it was hard to get over here. I’ll buy it one day. I certainly will Cynthia, and I hope you love this too when you can find a copy!